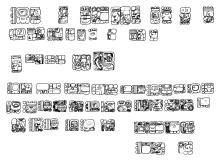 Description: Text of Hieroglyphic Stairs, House C, Palace. Records K'inich Janaab Pakal's birth and accession, and the sacrifice of a Calakmul vassal early in Palenque's history. Also noted is an eclipse (associated with a "yitah" of Itzamnaaj B'alam II of Yaxchilan) and a visit from an Ajaw from Tikal. 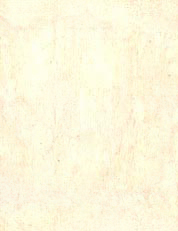 A series of prisoners (also recorded on House C, East Court Panels and on Temple of the Inscriptions Panels) are named; text concludes with the dedication of House C.
Notes: Glyphs A1-A5 record Janaab Pakal's birth on 9.8.9.13.0 8 Ahaw 13 Pohp; B5-A6 note Pakal's accession on 9.9.2.4.8 5 Lamat 1 Mol. The eclipse and dedication of House C occur on 9.11.6.16.11 7 Chuwen 4 Ch'en. 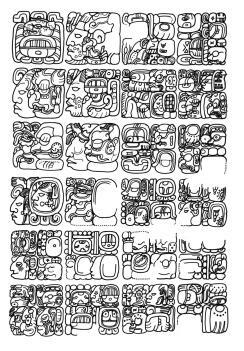 Description: Glyphs recording accession of Ajaw K'ak' Tiliw Chan Yoaat and capture and sacrifice of Waxaklajuun Ub'aah K'awiil ("18 Rabbit") of Copan. 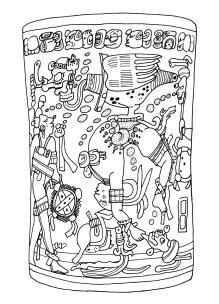 Description: Cylinder vessel illustrating Celestial Bird seated atop human sacrifice.